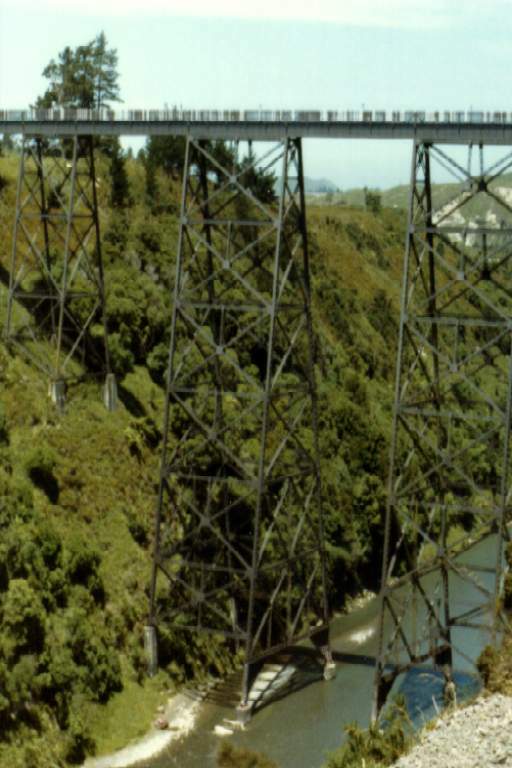 The highest railway viaduct in New Zealand is the 97 m high Mohaka viaduct spanning the Mohaka River about half way between Napier and Wairoa. This bridge is of steel girder construction, is 270 m long and was opened in 1937. Organisers of last week’s symposium in Gisborne on the future of the Gisborne-Napier railway say the Hawkes Bay Regional Transport Committee report released yesterday does not provide sufficient analysis and an independent study on future scenarios needs to be commissioned. “We still need a comprehensive review of future options for the line that takes into account social, safety and environmental benefits as well as freight volumes and tourism options. The paper from yesterday’s meeting will help in terms of the additional market information, but the relative roles of the modes into the future still deserve some in depth analysis” said Transition Tairawhiti spokesperson Manu Caddie. Mr Caddie believes there will be competition for the future traffic between rail, road, and coastal shipping. The quantities the paper suggests could well make the railway viable, but if the region wants to have a railway line, it has to use it and not assume that road or the port gets the first crack at the traffic. The report commissioned after a meeting in Gisborne two months ago with Kiwirail CEO Jim Quinn, regional mayors and Chambers of Commerce, calculates the social cost value of road accidents in the region as $182 million. Hamilton City Council has an outright ban on allowing 53+tonne trucks on their roads, other than State Highways, until they know precisely the costs it will impose on the ratepayers. Mr Caddie suggested Gisborne could do the same, particularly considering the exclusion of truck trailers from fuel tax increases last year. Mr Caddie believes the short timeframe in which the report had to be completed did not permit the consults time to do the in-depth analysis to make robust recommendations on the best way forward. Mr Caddie said the regions should investigate with Kiwirail and the government the potential to provide the service at cost to get the volumes up. The Rotorua line has been mothballed for nine years and there is now substantial work required to re-open the line. Not a quick or cheap job, cost estimates range from $10-15m. Jon Reeves from the Campaign for Better Transport estimated, based on the Rotorua line assessment, it could cost over $100m to reopen the Gisborne-Napier line if it is mothballed. Mr Caddie says the report also has some obvious gaps such as the true transit times of HCV’s (trucks). Well done with the discussion yesterday (Thursday) in the GDC Council Chambers. There were many points raised and I share the frustration of inadequate information on which to make sound business decisions that involve the use of the rail link from Gisborne to Napier. I fully support the proposal by King and Small to collate a comprehensive analysis of opportunies and challenges for a viable Gisborne-Napier link. There are nit-picky questions about the use and ownership of the railway yards. Right now Toll Translink operates a road freight business from there. Rumour has it that it is rent free usage of the area – could that be verified AND JUSTIFIED if it is true. I have talked to some of the maintenance people and ON-Track folks. They tell me the Mohaka Viaduct is sound but there are other small bridges that need attention. Is there a recent engineering report on the rail line that the public can access? Your idea for a web site to bring all this information together is a very good one. The GDC has designated the Dunstan Road area as heavy industrial area for forestry. The rail runs right through the area but is not used by either Prime Sawmill (WPI) or Juken NZ who are operating at this time. While I can concur with the problem of double handling associated with logs I am at a loss to understand why products (lumber, plywood etc) are not cargo for the rail, especially if it is going to Napier Port. Juken does have a ship call every two months or so at Gisborne Port so that is a more local challenge. Hikurangi is supposed to be setting up a manufacturing plant but the progress on that is quite slow. We do need more secondary manufacturing in Gisborne – lots of logs, real opportunities here to send away products rather that just logs (there will always need to be the log option). Considering that logs are 50% water and that 30% or more ends up as sawdust, we could send away 3 times the weight of processed product in the same volume as occupied by the logs. The port is running out of storage area. Why not set up a weigh station and storage yard in the MacDonald Road area and move the logs by train to the port for loading? The logistics for that would need to be evaluated. The rail of course no longer goes properly to the port of Gisborne – it has been curtailed at the Gisborne Tatapouri Club. This does allow the Steam Train to come over the bridge to the Club area to pick up the tourists from cruise ships that come in 4 or 5 times a year. One final point – does Kiwirail have the locomotives and rolling stock to service Gisborne? Right now their rolling stock is for logs, flatbeds for containers, occasional bulk shipments of grape juice, Iceliners for frozen items. Do they have proper lumber carriers for example? Enough from me for now. I wish you every success Manu in the upcoming Gisborne elections. You have a sound head on your shoulders and Gisborne will be lucky to have you on the GDC.